As with Ed Miliband’s speech on ‘Englishness’ in June, his speech on immigration at the end of last week was used as a pretext to launch into another ‘celebration’ of Britain’s, particularly England’s, newly found ethnic ‘diversity’ (i.e. Balkanisation). Whereas the first of the speeches was trailed as Miliband recognising that Labour had ‘got it wrong’ with respect to its routine demonisation of Englishness and its equation with ‘racism’, and the second as an acknowledgement that Labour had ‘made mistakes’ in its open-door immigration policy, neither in fact proved to be the case; Miliband provided his own definition of ‘Englishness’ that denied the English the right to their own identity, and ‘apologised’ for mass immigration by stating that we had not done enough to help the immigrants. So, for all of his toying with ‘Blue Labour’ rhetoric, even the substance of that strand of thinking within his party proves to be excessively unpalatable for him. What facts does he provide to back up such assertions? Why is it ‘crucial’? How has it ‘made us stronger’? Clearly, it is not 'crucial' and it has not 'made us stronger', and he did nothing to bolster his argument other than continue to repeat such assertions in a variety of verbal forms throughout the remainder of his speech. The reality is that the ongoing Balkanisation of Britain has helped to fuel riots, demands for special religious privileges, restraints upon freedom of speech and expression, discrimination in the workplace in favour of those of a non-indigenous background, a diminution in animal welfare standards, and increased stress upon our public services, whether they happen to be health, education or social security. The Daily Mail was not impressed with his speech, and noted that ‘There are now around a million households where no on speaks English.’ What do these ‘million households’ add to our country, other than a deadweight? How many millions live in these households altogether? They constitute an extreme drag upon our economy, and deny homes to our young couples who wish to start families but are unable to do so because many larger dwellings are filled with non-English speaking immigrants. Furthermore, the enormous decadal increase in population brought about by mass immigration and the immigrant-descended population has assisted in inflating the property market and making homes unaffordable; it is an increase that has helped to choke our roads and to overburden our trains. All of this we must now suffer at a time when our economy is at best at a standstill. Our standard of living, whether measured in monetary terms, in the quality of our housing, in the general standard of our environment or in the services that we receive, is falling, and yet we are told that it must fall still further because of the ‘decarbonisation’ of the economy, whilst we make room and accommodation for more immigrants. And these observations of course, do not take into account the broader negative cultural impacts. Miliband, naturally, does not see let alone acknowledge any of these objections. So, there you have it: to object to mass immigration, globalisation and ensuing national self-dissolution is according to Miliband tantamount to fascism. Out of the three men he mentioned, Powell was the only one who was decent, and he has, contrary to Miliband’s speech, been proven correct in his observations and predictions. Whereas Miliband’s speech upon immigration will be largely forgotten in a decade’s time, Powell’s is an historical artefact that will remain. 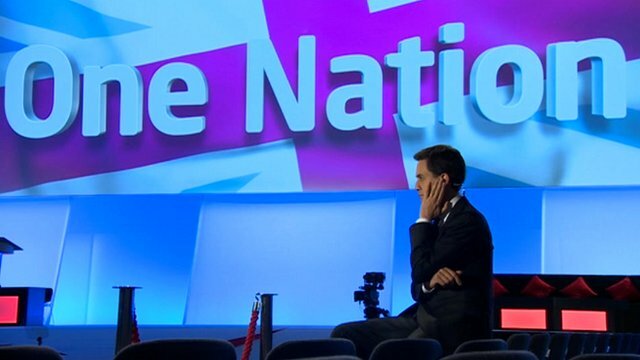 As is customary not only for the Labour Party, but also for the BBC and UKIP amongst others, Miliband chose to emphasise Eastern European migration, omitting to mention that the majority of immigrants over the past 15 years have not come from within the EU, but from Asia and Africa. The census figures released this week confirm this. So, if you should think that the building of social housing in our county towns and villages would be primarily to accommodate local people who cannot afford to buy their own homes, think again. Under a Labour administration – and probably under the current Condem Government – such homes may well be used to help enforce ‘mixing’, with immigrants being relocated from the globalised urban centres which were once English cities to a location near you. Will there be a Somali ‘community’ in Bridport for example? Ed Miliband would doubtless be delighted at such a prospect. intent on ensuring that the British people become a minority in their one and only homeland. They should also be aware that the Tories will put-up no serious resistance to this project. No, the Labour Party will not apologise for this, as it would prefer to revel in what it believes it has 'achieved'. Frank Field might be an honourable exception to the rest of the parliamentary Labour pack in this respect though. The disingenuous equation of asserting and defending our native identity against mass immigration with fascism and nazism by the totalitarian left as well as by 'liberals' has been efficacious. Whilst fascists and racial supremacists exist on the fringes of British nationalism the vast majority of nationalists, like the vast majority of non-politically active but nationalistically inclined members of the British people ( the majority! ), are no such thing. Note also how Farage ( like the tabloids Daliy Mail and Express) only critiques mass immigration in terms of logisitics and the fiscal consequences, NEVER the social and cultural consequences - because for Ukip, anyone from anywhere is as British as someone whose ancestors in the British Isles date back over millenia provided that they can speak the native language, and this is exactly the same as what Milliband and the 'integrationists' fallaciously claim. I think some very targeted demonstrating at some of Millibands walk abouts and public appearances with some 'to the point' banners and placards exposing the implications of Milliband's plans would be even more efficacious. Seeking to overcome the anti-national globalist narrative with leaflets alone will be very difficult NWN, given the manner in which the former permeates every product of the mass media and marketing, as well as the mainstream political narrative within the UK and at the transnational level where the US has trailblazed this mode of multiculturalism and national deconstruction. As you note, the Daily Mail and Express, for all of their apparent hand-wringing about mass immigration, prescribe nothing other than having a good grumble whilst letting the policy of national dissolution continue apace, for they, like UKIP, treat any real opposition to this process as ‘racist’. NWN, I agree with your opinion regarding UKIP (not that this should be a surprise since they aren't genuine nationalists just Tory anti-EU Thatcherite Right-wingers) and also the Daily Mail (or should that be the Daily Whine? )and Express. The problem is if a nationalist party did this (I think it is essential) would ordinary voters take it in or has the globalist brainwashing of our nation gone so far that they don't even recognise what their ethnicity actually is? I agree with you on Enoch Powell; the only criticism I would make of this visionary is that he couched his famous speech in the language of another generation. "The black man" in no way wields the whip hand over "the white man", whatever he thought he meant by these phrases - he was talking in a time when race was widely thought to be a real thing, instead of a construct used to justify slavery first, then eugenics. Rather, the beard-and-burqa extremists have the whip hand over every of every background withinn these shores. Everyone I talk to about the parlous state of this country can on some intuitive level see the ongoing un-development of this nation, some only in a periferal way without seeing the bigger picture. Most however respond with an air of resignation when asked their opinions on a remedy for our situation, finishing with 'what can I do about it anyway?' It would seem on the face of it that we have a fait accompli on our hands and now Britain is destined to sink into a barbarous pit of impoverished, competing factions. I however cannot let this go and after my daily rant at laughable BBC news coverage and 'on message' adverts for sofas and electrical goods I am left wondering what I CAN do? What can an honest, tax paying, reasonably intelligent Englishman do to stop the disollution of his nation without being scooped up by the State and prosecuted on some self serving legal technicality? Oswald Moseley, a member of the Fabian society, Red Ed Milipede, a member of the Fabian society. A quick read through that speech. "It is somewhere where people of all different backgrounds, Muslims, Sikhs, Hindus, Christians and those of no faith, live and work together." Oh look, whihc religion is mentioned first? The national one or the immigrant one? "But it was an even bigger privilege to see Mo Farah win the first of his gold medals." Farah is an asylum seeker from Somalia, who often wears his (not Britain) country's flag. What about our cyclists and swimmers, did their achievements count for nothing? Cameron was exactly the same when asked about Olympic achievements, he mentioned Jess Ennis and Farah. And he replied “This is my country mate”. Oh really? This photo in 2010, I'm just imagining it. "And their diversity was reflected in the crowds that cheered them on." There's the buzz word, diversity. "I love the diversity of London." I'm going to go back to watching the cricket now, because I'm getting boring. But just one last thing, no speech would be complete without mentioning the saint. "Despite our national troubles -- from the riots in the 1980s to the horrific murder of Stephen Lawrence"
Mo Farah can in no way be described as British. He hasn't even got a British name for god's sake let alone is he a being of British ethnicity. I could speak perfectly fluent Japanese and live in Tokyo but would the average Jap regard me as a member of their nation no of course not! The British alwys tried to find homes and accommodate non-whites, but those non-whites always tried to prevent the whites from having a home.